Puebla gastronomy, as part of Mexican cuisine tradition, was inscribed on UNESCO "Intangible Cultural Heritage List" in 2010. Puebla is worldwide known for its rich historical heritage, artistic diversity and architectural beauty. Many nuns, in the colonial convents of the city, were excellent cooks and made up a large diversity of street food and dishes that provide to Puebla traditional gastronomy a worldwide fame. 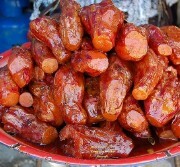 Camotes are sweet potate-based candies flavored with different fruits such as strawberry, orange or lime and come wrapped up like cigars. Cemitas are a kind of sandwich served on a sesame-seed roll. The featured protein varies, common choices are pork "milanesa" and "pata de puerco", but it's nearly always accompanied by avocado, cheese, onion, olive oil, Serrano chili rajas or Chilpotle and some pápalo (summer cilantro) leaves. Chalupas are date back in Colonial times when Spanish settlers spent a good part of their days washing clothes by San Francisco river (now 5 de Mayo Boulevard). It's said that the women carried soiled garments to the river in wide-mouthed but relatively shallow wicker baskets called "chalupas" after which they would rush home and quickly fry up corn tortillas in lard and top them with leftover salsa and shredded pork and bits of onion. Chiles en Nogada are a rich and savory-sweet entrée that features a Poblano chili pepper stuffed with "picadillo" (ground or chopped pork or beef cooked with locally grown apples, pears and peaches). 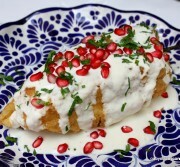 The chili is then dipped in an egg batter, deep fried and finished with a walnut cream sauce, parsley leaves and pomegranate seeds. The green, white and red toppings represent the colors in the Mexican flag. This seasonal dish is available from mid-late July through September, when its ingredients are at their peak. Huaxmole is a traditional dish from the kitchen of the “Mixteca Poblana” located in Southern Puebla State and prepared with goat meat, chili and “Huaje”. When it is not possible to have goat meat, you can use ram or beef. Huaxmole comes from Aztec word “Huaxmolli” literally means “Huaje” stew. Huaxmole has a ritual function and is served only on some holidays. It is not a food that is consumed usually in Mixteco communities, partly because of the onerous of preparation (recall that the Mixteca is one of the poorest areas throughout Mexico). However, in the cities of Matamoros and Acatlan Izucar Osorio in Puebla State it is possible to find Huaxmole in some restaurants. Memela or also called "gorditas" is an oval tortilla made with corn dough and hand smeared with lard, thick and carried inside ground beans. 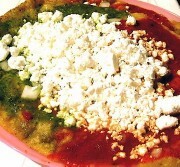 It is fried over low heat and covered with red or green "molcajete" salsa, sprinkled with cheese or "quesillo". Memela is a variant of tortilla and pueblan traditional dish that has existed since pre-Hispanic times. In the Resurrection neighboardhood of Puebla city over 70 percent of families, all members who speak Nahuatl (Aztec), remain from the sale of memelas and "gorditas" in different markets of the city. Mixiote is a typical dish from central Mexico, consisting of steamed chili-falvored beef, wrapped in a Maguey cactus film. This film is called mixiote. The meat can be used sheep, chicken, rabbit, pork, beef or fish, and cooked with some kind of sauce, chili and smelling herbs usually like avocado leaves, bay leaf, thyme, marjoram and oregano. Sometimes mixiotes can be filled with some seasoning, as nopales and potatoes. Mole de Caderas (Hip Mole) is a traditional dish of goat meat in the region of Tehuacan, Puebla. In preparing the mole hip flesh and bone of the hip, based condiments salt, chile used and dip in lemon to give it a special touch, with a broth of boiled meat with red hips and wild beans. Traditional Mexican dish which bears the distinctive ingredients hip and spine of goat. The sauce is made with guajillo, coastal and serrano chiles, tomato, tomato, avocado leaves, cilantro and bean typical of the region. Hips are cooked in water with onions, garlic, and salt; chiles are roasted and prepared in sauce, and it joins the broth with toasted avocado leaves; the beans are added when the meat is cooked. Mole de Olla is cooked with vegetables such as green beans, corn, squash, zucchini and potato; also usually seasoned with various herbs, especially with epazote. One of the most important ingredients is the xoconostle whose flavor is strong bittersweet, its most common use is in sauces or seasoning mole de olla and which gives more flavor. Dried chile, onion and garlic are the condiments saucer and important source of protein and nutrients. And finally, beef is the protein attached to the plate. 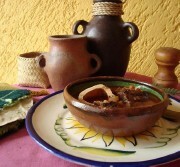 Mole Poblano is a culinary specialty of the city of Puebla. Originally consisted mainly sauce a variety of ingredients poured over turkey pieces but is now common use with chicken or other meats. Mole poblano sauce combines several ingredients such as cocoa or chocolate tablet with no or very little sweet, ancho chilies, mulato chiles, pasilla chiles, chipotle, tomatoes, almonds, bananas, nuts, raisins, sesame seeds, cloves, cinnamon, parsley, pepper, onion, garlic and tortillas. Correct proportions, properly not exist, and some ingredients may be waived or varied in proportion. It is essential that one day before preparing the mole should be roasted and remove seeds from chiles, then soak them in salt water overnight. 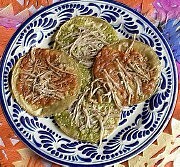 Molote is part of Mexican cuisine, especially the Mexican snacks. It is a popular food in some states of Mexico such as Puebla. It is a dish made with corn masa mixture and mashed potatoes, which were filled with "picadillo" meat (hash) shredded beef or some other dish. Fry in plenty of butter or oil. 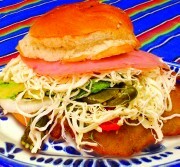 Pelona is fried piece of bread in oil and filled with chicken or pork, cream, lettuce, and green or red salsa. Pipian Verde is a characteristic sauce from Puebla cuisine made with pumpkin seeds, depending on the additional ingredients can be red and green varieties. It is used for chicken or pork dishes. Tacos Arabes (Arabic Tacos) are arabic-recipe to cook "pork meat" tacos were likely influenced by inmigrant cooks from Iran and Lebannon to Puebla. It is stacked with pork instead of traditional lamb because Puebla likes pork better. "Tacos arabes" pile slices of spit-roasted pork on pita-like flatbread to which dinners add Chilpotle or spices salsas to taste and squeeze of lime slices to get a richer flavored taco. Tinga is made with shredded meat (chicken, beef or pork), a sauce of tomato, onion, garlic and a variety of chiles. Originally from Puebla State, it is always consumed as a garnish for other dishes such as Tinga "tostadas" or filled Tinga "molotes". The original Puebla recipe consists of finely shredded chicken breast, onion, finely chopped garlic, chipotle chili to taste, diced tomato, oregano, thyme laurel, pepper and salt. Tortitas de Santa Clara are round, shortbread-like cookie topped with sugary pumpkin-seed icing. Pick up a week day for fun hands-on cooking lessons on the Mexican cuisine arts for 3 hour class in Puebla. Lety Vergara is a cook that offers a cooking class and leads you into a Puebla traditional local market for a broad overview of local ingredients and flavours before you whip up authentic Mexican dishes. Or, upgrade to "State of Art" seasonal dishes in Puebla cuisine and spend more time in Lety's kitchen. 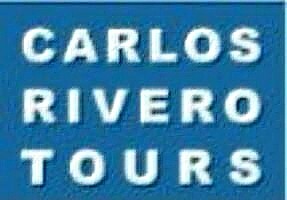 Enjoy personalized attention on this experience limited to just three up to four people.